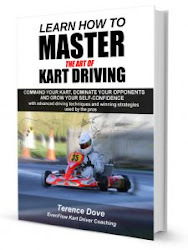 Kart Driving Mastery with Terence Dove: Why are British kart drivers absolutely crushing it at top level karting right now? Advice on mastering kart driving from leading professional kart coach. Why are British kart drivers absolutely crushing it at top level karting right now? There are lots of nations around the world with great talent and fantastic racing, but I reckon the following perfect storm of factors helps the UK churn out karting talent like no other nation. Karting1 made a flippant tweet after Danny Kierle won the World title, that winning a clubby at PFi would probably be just as difficult as winning the world champs. Thinking about it, that is most likely perfectly true. 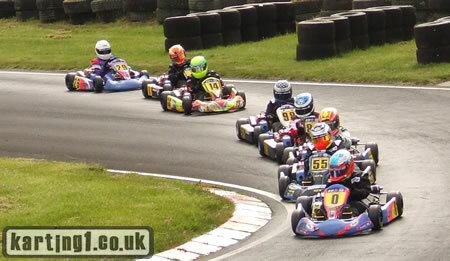 The sheer density of talent racing at PFi in the X30 classes on a regular basis is incredible. I think it is conservative to say that at a winter series race, there will be at least ten world class drivers duking it out. The other 25 drivers will be seriously quick too though! So if you want to win a winter series race at PFi in Senior X30 it is likely that you will have to beat 3 current world champions in the process. Where else in the world is that the case? The intensity of competition at PFi on a regular race weekend is incredible, and this makes the drivers super competitive and of course all the support they have from teams, mechanics and engine builders is top notch. The quality of the PFi facility is such that everyone in the UK wants to race there, which combines with all the other factors below to create a World level competition there at least once a month! From where I am writing this, I can drive to at least 4 different quality kart tracks within an hour. These are PFi, Shenington, Kimbolton and Whilton Mill. These tracks are open all year round for racing and the Brits race and practise at these venues in all weather. The tracks are all completely different, and strange in their own way so that the drivers gain tremendously wide experience. The clubs are smart enough to run races that don't clash too often allowing a driver to race every weekend of the month against tough competition. This creates constant development in an intensely competitive atmosphere, especially in the cadet classes (more on them in a bit). Races are very rarely cancelled because of weather, so the drivers here are toughened up in conditions that can only be described as horrific! The coldest I've seen at a race meeting was minus 12 degrees, and there was not a hint of cancellation in the air. During the PFi winter races it is almost inevitable to see a dry line appear on the circuit that is exactly one kart width wide, meaning everyone has to run on slicks so going a few centimetres off line can result in disaster. Combine this situation with running under spotlights, heading under the bridge flat out whilst smashing over kerbs at 70+mph with 30 other nutters trying to beat you is a unique and regular situation for drivers racing in the UK. For me they are absolute bloody heroes! The UK is motor racing bonkers. The teams, parents, drivers are all crazy for motor sport. They are also aggressively competitive, sometimes you could say it goes over the top (we are a bit savage), but it creates such a focused and unforgiving atmosphere that it inevitably produces a wealth of talented and resilient drivers. Motor racing seems to have a hold on the Brits more than any other nation I know, and this breeds talent naturally. Weekend off? 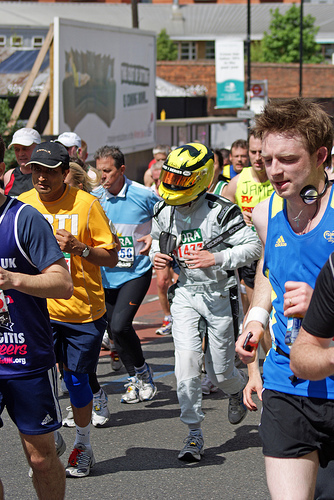 Run the London marathon in your karting kit - typical lunacy from British drivers! I believe that if you can win a British cadet karting championship, there is not a motor racing category in the World that is beyond your capabilities. British cadet karting is incredible, the drivers are complete racing drivers and so are all their support personnel whether we are talking about the teams or parents. There is nothing like British cadet karting anywhere in the world for sheer competitiveness and those kids come out of cadet karting ready for any level of competition out there. 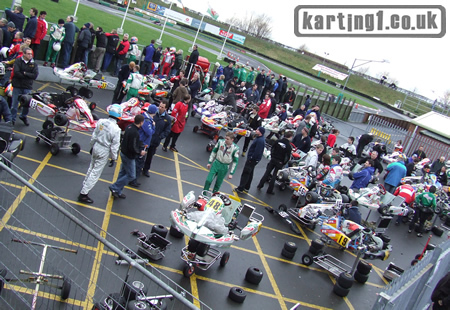 UK cadet drivers unusually spaced apart, usually they are fully attached to one another! If you are used to running in races from the age of 8 years old where absolute professionalism is a given, and the smallest mistake means the difference between a win and 30th position, then running at world level is not daunting at all. It's just another day at the office, and these drivers treat it as such! So if you want to race the best, and test yourself in the toughest racing environment in the world (including any other motor sport category) come and race karts in England. If you can win here, you can win anywhere, in anything!